Delhi woke up to a foggy New Year on January 1, but that didn’t deter its people from hitting the roads, literally, to continue celebrating. NEW DELHI: Delhi woke up to a foggy New Year on January 1, but that didn’t deter its people from hitting the roads, literally, to continue celebrating. Massive traffic jams brought the city to its knees on the first day of 2018, with vehicles crawling in the second half. As the sun was setting, over one lakh people headed to India Gate, with vehicles choking the heart of central Delhi. Traffic stopped and crawled at Vikas Marg, Mandi House, Parliament Street, India Gate, Connaught Place, Ashram, Ring Road and Lajpat Nagar. Adjoining areas such as Barapullah, ITO and Delhi-Noida-Delhi Flyway witnessed massive jams. The huge number of vehicles worsened the air quality. Pollution tracking centres showed a further rise in pollutants by evening. Levels of lethal particulate matter in the city were hovering around the danger mark since morning.According to Delhi Traffic Police, more than 100 personnel were deployed to regulate the traffic. “Traffic will remain very heavy near India Gate C-Hexagon due to gathering of more than 1 lakh pedestrians and heavy volume of motorists. No parking available around India Gate. Advised to avoid India Gate and take alternate route,” Delhi Traffic Police warned on Twitter on Monday evening. 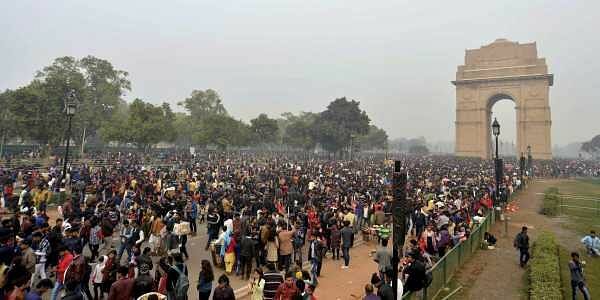 “All roads connecting India Gate were choked due to pedestrian movement at India Gate. As a spillover effect, other roads like Ring Road, Connaught Place circle, Akshardham and National Highway 44 witnessed heavy traffic jams,” a Traffic Police official said. On New Year’s night, Delhi Traffic Police fined more than 1,700 people for drunk driving. Deependra Pathak, Delhi Police Chief PRO, said 745 challans were issued for drunk driving before 12 am and another 1,007 were issued after midnight. More than 90 per cent of the violators were youngsters.